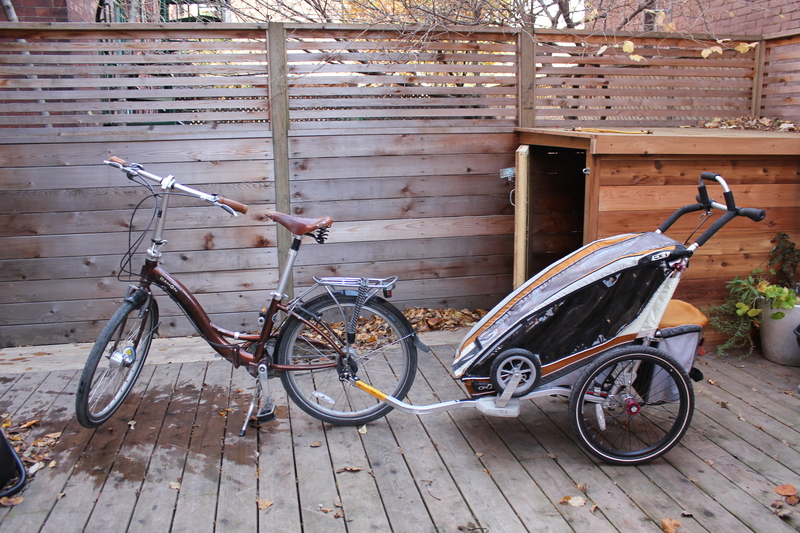 Among the toddler-toting parents I know, I’m one of the only ones who opted for a trailer. Which kind of surprises me, since I was always one of those people who, driving along in my car would look at the rosy little face staring with trusting eyes into the spinning hubcaps just a few feet away, and ask myself how a parent could possibly place their child in such a vulnerable position. Well, it depends on a lot of things, including your cycling style, the city you ride in, and your comfort level with the volume and type of traffic on your streets. 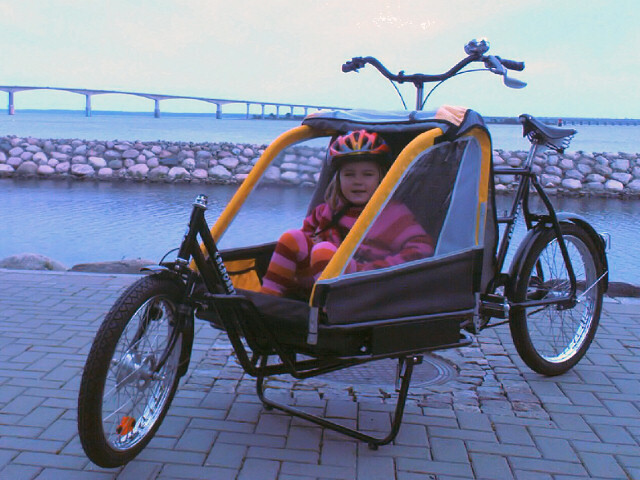 The German national automobile club did a comparative safety test with the child on the bike and in a trailer. (Wow, you’re thinking, their automobile club does bike safety tests?) Here’s what they found. There is no clear winner in the contest. When it comes to safety, all else considered, the trailer is marginally safer. This is mainly because of its stability. You can fall on your bike, and the trailer will still stay upright, whereas if you fall with the child on a bike seat, the child falls with you. This also means that if you hit an unexpected obstacle, your child will be safer in the trailer. And changing lanes is safer with a trailer, particularly where there are streetcar tracks. Also, your ability to swerve out of danger is slightly worse with the bike seat. And don’t forget the lighting. If I have to be out after dusk or in the rain, my trailer is lit up like a Xmas tree. Also, I cycle all year, so S. stays dry in the rain (I get wet) and warm in the snow (I get cold). And she can sleep underway. 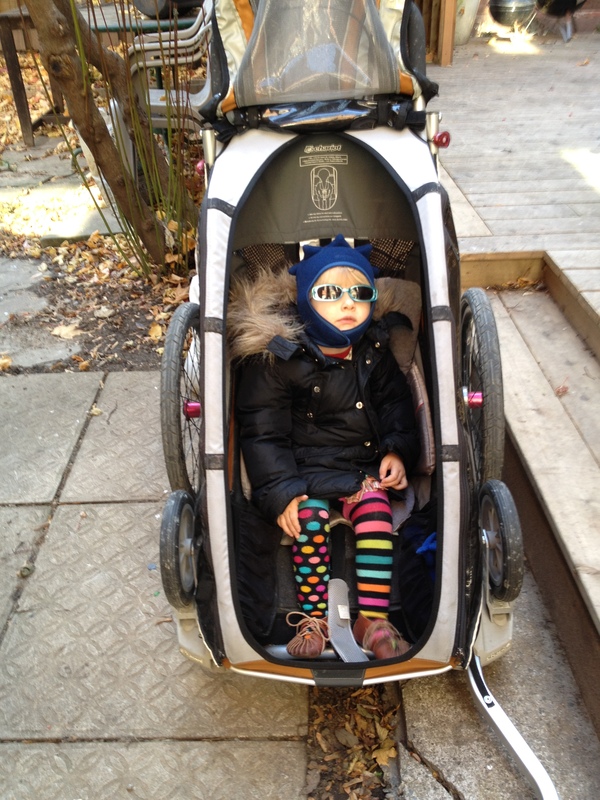 Like she did today on her way back from Trinity Bellwoods Park. The other thing that speaks for the trailer is, paradoxically, the very reaction I described at the beginning. Drivers see much more clearly that there is a child in transit, and most of them react accordingly. That said, the child on the bike seat is less likely to be injured if a car hits you from behind, and braking handling is generally better with the child on the bike. Also, a lot of parents like the fact that their child is sitting on the bar in front of them, where they have the sense that their arms are enfolding them. ConsumerReports.org is more unequivocal in favour of the trailer. They state three main reasons: 1) it’s lower to the ground, more stable, less risk in case of a fall; 2) it’s easier to maneuver; and 3) the child is surrounded by framing & better protected. But the main message coming from ConsumerReport.org and the German Automobile Association tests is that your child’s safety depends mainly on your cycling skills, on being correctly secured, and wearing a helmet. Remember you’ll need longer to brake, and stability will possibly be an issue. My first decision was to rule out the on-bike option. For me it was purely practical. I wanted to use the trailer all year, and I wasn’t happy about the stability issues. My main route was going to be home to day-care and the park, and I was confident of my ability to keep S. out of traffic while using the trailer. But I did like the idea of having her in front of me, rather than behind where I couldn’t see her. 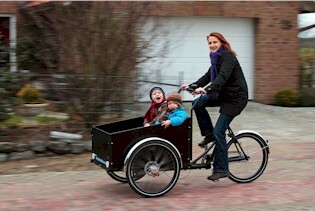 This got me really excited about the Zigo Leader X2, a trike with two wheels in the front, holding a child carrier. It converts through an ingenious method to a two-wheeler. I thought this would be ideal for me, so I went down to Urbane Cyclist to try it. The result was more than disappointing. The turning circle was terrible, you can’t even turn right on the street without stopping and lifting the rear wheel. Then you should have seen the guys at Urbane trying patiently to do the conversion. It took literally 15 minutes. And all this for between $1,300 and $1,500. There is a huge choice when it comes to trailers. Here is an excellent article on trailer buying, written it seems, by a professor of Astrophysics at Harvard. Hmmm, that says something about the kind of people who take their kids in bike trailers. I finally opted for a Chariot CX. 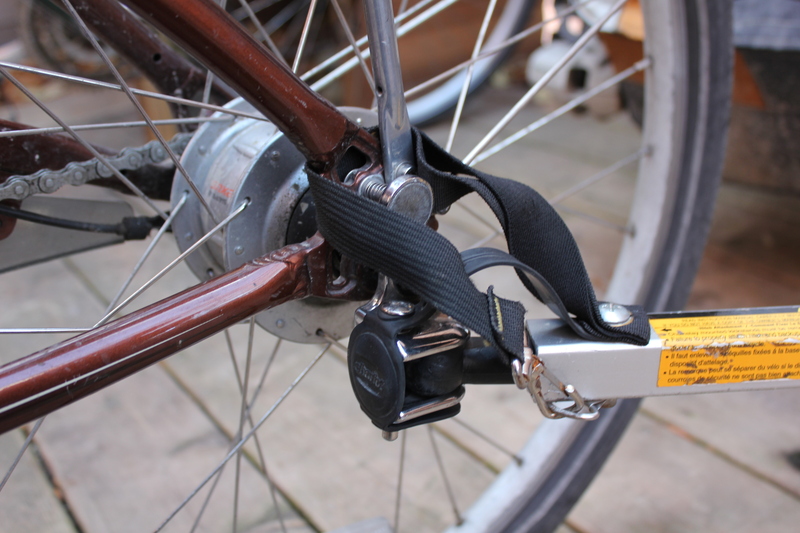 It’s easy to hitch and unhitch, can be moved from bike to bike. It’s extremely stable and easy to handle, and it keeps S. warm and dry through rain and snow. I’m the one getting cold and wet. I only have two complaints – it’s very hard to fold, and impossible to get the covering off to give it a good clean. I get really excited when I see these on Toronto’s streets. It makes me hope that by the sheer pressure of public usage, biking will become increasingly viable here. This entry was posted on Monday, November 28th, 2011 at 11:17 pm	and tagged with bike trailers, consumer reports, toddlers, transportation and posted in Uncategorized. You can follow any responses to this entry through the RSS 2.0 feed.